happy hour honeys: Happy Hour Honeys Reunite at Ping Happy Hour! Katie made it through her cross-country road trip, is all moved into her apartment (after a week of being roomies with me again!) and has been working for an awesome new start up - check it out here! So now that everything has settled down, we finally made it to a happy hour. Both a celebratory HH and work meeting - multi-tasking at it's finest - we enjoyed Ping with Katie Burgess, a friend from UP and our favorite Portland Monthly account executive. Ping was opened in 2009 by Pok Pok's Andy Ricker and a team of impressive Portland peeps including Kurt Hoffman, W+K's executive creative director John Jay, and style consultant Janet Jay. Basically, this sister restaurant had some high expectations to meet. 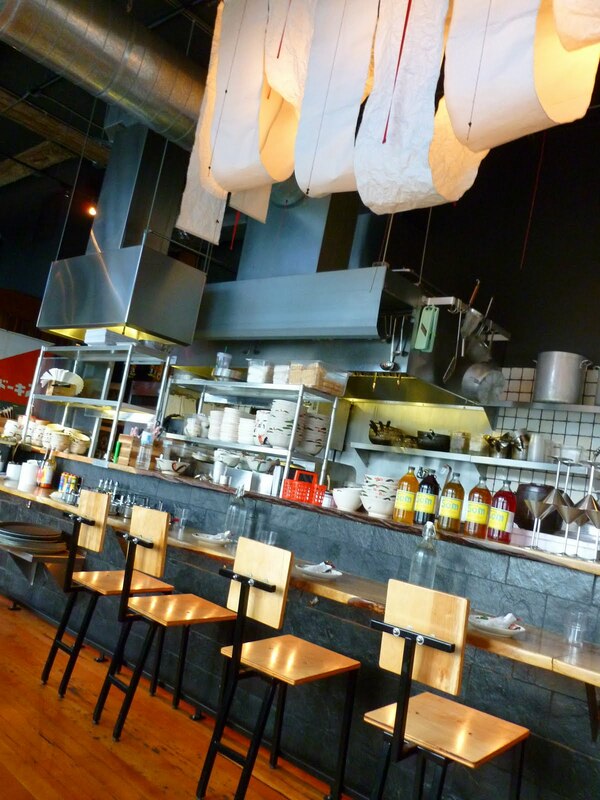 As you might have guessed, as Pok Pok's sister restaurant, Ping also features Asian-inspired dishes. Owner Andy Ricker described Ping as,"Southeast Asian drinking food - Indonesian, Thai, Vietnamese with a definite emphasis on Malaysian/Singaporean stuff." Read more from the founding team here. Reviews for the spot have been mixed, but we enjoyed our first Ping experience. 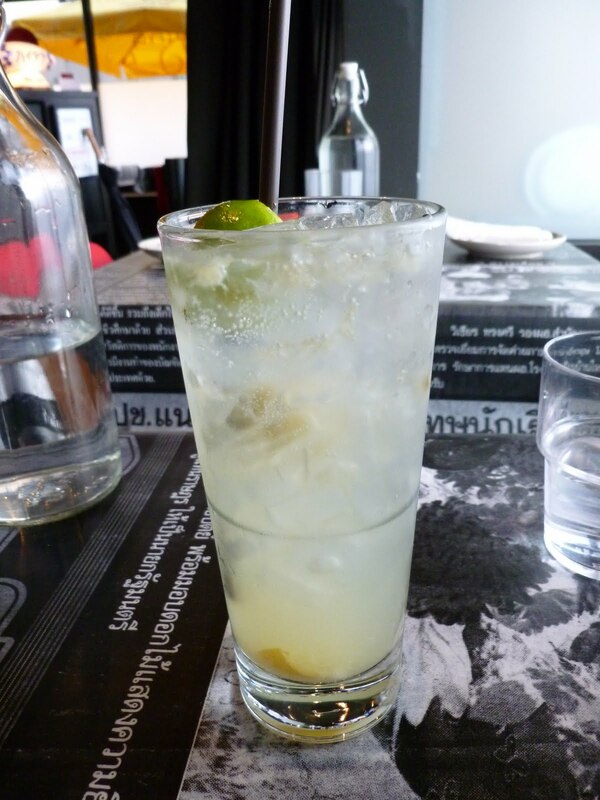 To get things going, we ordered the Salted Lime Tom Collins ($5.) Both fans of an original Tom Collins, Katie and I felt that the addition of salt made the drink more interesting, but it wasn't necessarily thirst-quenching since the saltiness begged to be washed down with something, well, less salty. Like usual, the three of us shared a selection of items off the small plate style menu. 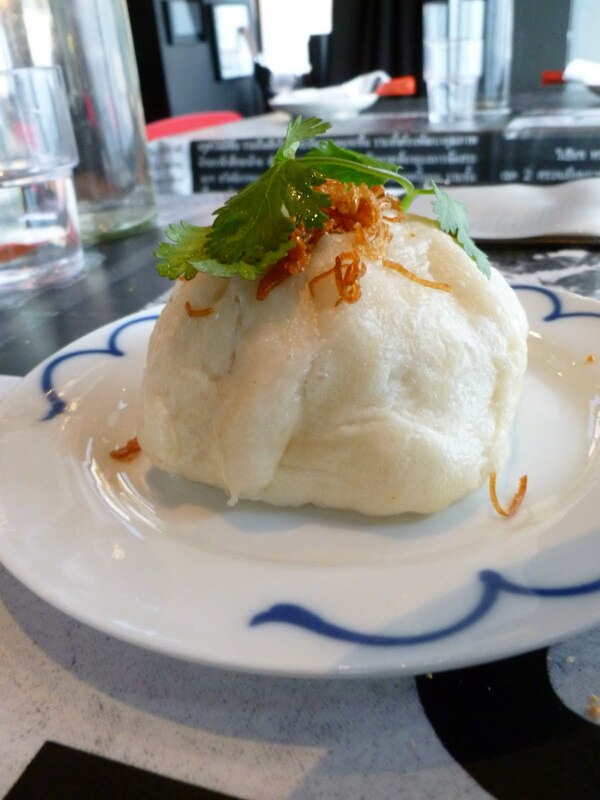 First to arrive was the Salapao ($3), a Thai-style steamed bun stuffed with sweet shredded pork and fried shallots. Apparently we were hungry since we finished it before realizing we neglected to take a photo, but no worries, it was one of our favorite items so we ordered another! Our second favorite from our selection was the Kobayashi Dog ($5), a beef frank grilled with teriyaki, and served with wasabi mayo, cucumber relish, bonito flakes and toasted nori. The large bun slightly overwhelmed this hot dog, but the wasabi mayo added great spice while the cucumber relish was fresh and crunchy. We were glad to have shared it, but for $5 it's definitely a great option if you're ordering solo. It was about time for another cocktail, but we needed to try something new. We all opted for a well drink with Pok Pok Som drinking vinegar ($5.50)! This was such a unique, simple and delicious drink we went back and bought some Pok Pok Som the next day (for Thursday Night Dinner!) Based on suggestions from our waitress, I ordered the tequila lychee, Katie went for the gin rhubarb, and Katie B. selected the vodka passion fruit combination. All of them were great depending on your preferred type of liquor, but we decided Katie's combination of gin and rhubarb was amazing! In addition to our second round of cocktails, we also enjoyed the Wild-Caught Gulf Prawn Skewer ($2 each) and the Roti Dhal ($3.) 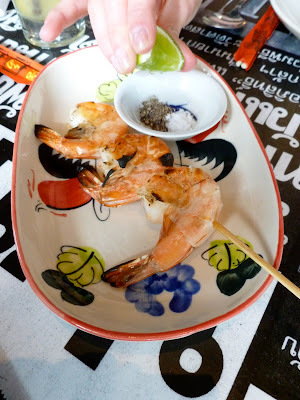 The prawn skewer was simple and could easily be replicated at home, but with three shrimps on each skewer, it was fairly priced and tasty. A fun component of this dish is the "do-it yourself dipping sauce" where you squeeze the lime wedge into a dish of salt and pepper, then stir. Simple, good and like I said, easy to replicate! The Roti Dhal is Malaysian flat bread served with yellow lentil curry. This was probably my least favorite dish and I wouldn't order it again, but Katie B. was a big fan. For me, the dish was bland, but perhaps my over consumption of salt has affected my palette! Ping's HH is affordable, offering good food and drinks with a relaxed and welcoming atmosphere. It's a nice place to meet up with friends or family to enjoy a communal dining experience and try something different. I've heard good things about the Spicy Mama Ramen ($6)! So glad to have Katie back in Portland with me and I have a feeling we'll be hitting up a lot more of Portland's HH's now that we're reunited!